Release more content. Sometimes we want to publish more than once per week. Event coverage. Packet Pushers will likely be attending more events such as Cisco Live 2012 and Interop this year. We need space to publish more shows as part of our commitment to these events. Try out new ideas and content formats and check with the audience to see if it works. Content Floods. We know that it’s important to release content regularly, but we might dump a whole bunch of shows into the Priority Queue in a single day. I’m sure you get the idea. Priority Queue is a part of gradually moving Packet Pushers to being a self-sustaining business without losing the independence and core values of being nerdy, informational and light-hearted at the same time. We can’t predict how Priority Queue will work out, so stick with us while we try out new concepts & ideas. To that end, we have created new artwork (first time in two years) and extra RSS feeds – here is a rundown of all of them. This is the Priority Queue Feed only. Having a separate feed to listen to occasional content makes sense. Not everyone wants to hear all the shows. This feed may get large amounts of content in a short time, or contain very niche content. This is a new Podcast feed that has the Weekly Show and Priority Queue combined. It’s podcast ONLY so it’s best for your favourite podcast client – Android being a classic example. If we add new shows in the future (and we have some planned) then they will be included in this feed as well as getting their own feed. The “Fire Hose”. 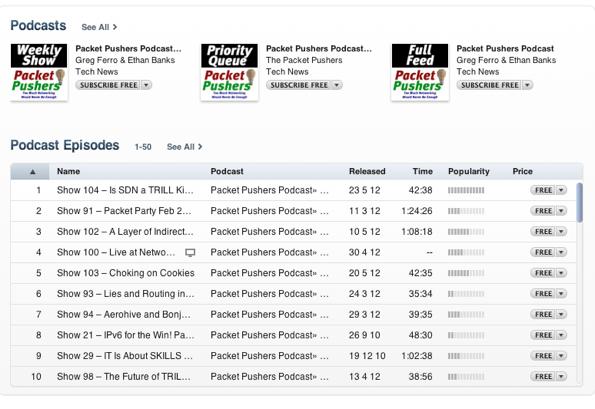 Anything that gets posted to PacketPushers.net will appear in this feed including blogs, podcasts, and updates from any category, anywhere. Some people listen to the show from their RSS Reader plus read all the blog posts. Ignore the “Blog” in the URL – it’s a mistake on our part (and now it’s hard to fix). This is the blog or article only feed for Job Placement advertisements. Several recruitment companies are trialling this as a way to reach applicants and it’s a small revenue source for us. This is the all-blog or article feed for Blog Posts only. If you are subscribed to the Podcasts in iTunes, or only interested in reading the articles, then this is the best feed for your RSS Reader. There are now three shows listed in iTunes and you can search for us as the Packet Pushers and pick the version that you like. As always, remember that, too much networking would NEVER be enough. Fixed. Thanks for picking that up for us. Any chance the feeds can be modified to include the full text of the blog posts instead of just the first paragraph so they can be read within a RSS reader instead of having to open & close a new browser tab for each post?